Dec. 26 marks the beginning of Kwanzaa, the seven-night celebration of African American and Pan-African culture. Dec. 26 marks the beginning of Kwanzaa, the seven-night celebration of African American and Pan-African culture. The holiday has grown to be celebrated by millions across the world, strengthening roots to both African heritage and the African community as a whole. What are the origins of the holiday? Dr. Maulana Karenga greets people during the "First Day of Issuance" dedication ceremony for the U.S. Postal Service's first-ever Kwanzaa stamp, in Los Angeles, Oct. 22, 1997. Dr. Maulana Karenga, an influential professor of Africana studies at California State University, Long Beach, created Kwanzaa in 1966 during the Black Freedom Movement. Kwanzaa decoration at the 5th Annual Regeneration Night Kwanzaa Celebration at The Apollo Theater on Dec. 30, 2011 in New York City. The name of the holiday comes directly from the Swahili phrase "matunda ya kwanza" meaning "first fruits." Celebrations surrounding "first fruits" have a deep history in African culture and major religions, although Kwanzaa itself is not a religious holiday. What do the colors red, green and black symbolize? 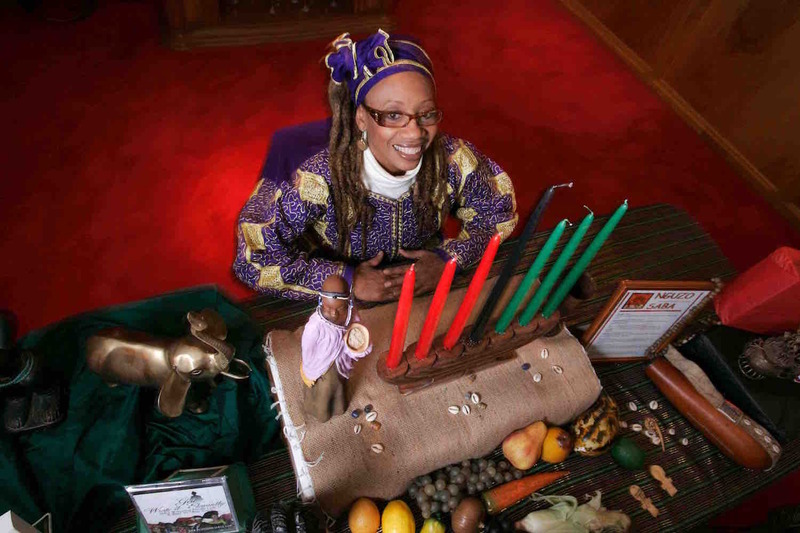 This photo taken Dec. 8, 2009 shows Ruth Ndiagne Dorsey with a Kwanzaa setting set up for a media photo at her church, The Shrine of the Black Madonna, in Atlanta. The official Kwanzaa website says that black symbolizes the people, red for their struggle, and green for the future and hope that comes from their struggle. Black, red and green candles are lit on the Kinara, a candle holder, during the holiday. 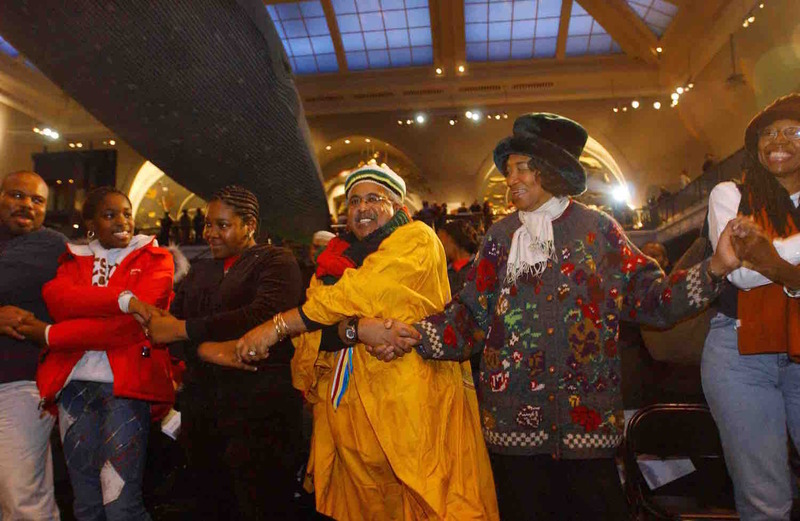 Many join hands during the annual Kwanzaa celebration at the Museum of Natural History, Sunday, Dec. 26, 2004, in New York. Each night, families light the Kinara while discussing one of the seven principles of Kwanzaa, called the Nguzo Saba. There are also seven symbols that are utilized each night of Kwanzaa. An African feast known as Karamu also takes place on New Year's Eve according to History.com. Parents also give children gifts during the holiday, which are encouraged to be educational in nature and promote African heritage. What are the seven symbols of Kwanzaa? The Tonel LaKay Drum and Dance ensemble performs during the annual Kwanzaaa celebration at the Museum of Natural History, Sunday, Dec. 26, 2004, in New York. The seven symbols of Kwanzaa are the Kinara (candle holder), Mishumaa Saba (seven candles), Mkeka (the mat) Mazao (crops), Muhindi (ears of corn), Kikombe Cha Umoja (unity cup) and Zawadi (gifts). The mat is laid out at the beginning of the holiday on a table in a central location in the home. Then the candle holder is set up on the mat along with the crops, corn, and unity cup. Kwanzaa committee set up to host a Kwanzaa celebration on Monday, Dec. 29, 2008. Day four, Ujamaa, recognizes cooperative economics. To build and maintain our community together and make our brothers and sisters' problems our problems and to solve them together. To do always as much as we can, in the way we can, in order to leave our community more beautiful and beneficial than we inherited. Third-graders at St. Ignatius of Loyola Catholic School in Denver celebrate and learn about Kwanzaa on Dec. 17, 2003. While the holiday honors both African American and Pan-African culture, anyone is welcome to celebrate Kwanzaa. Additionally, because Kwanzaa is not a religious holiday in nature, it can be celebrated alongside other major religious and secular holidays.